Judith is using Smore newsletters to spread the word online. We're always up to something. Here are the stories. 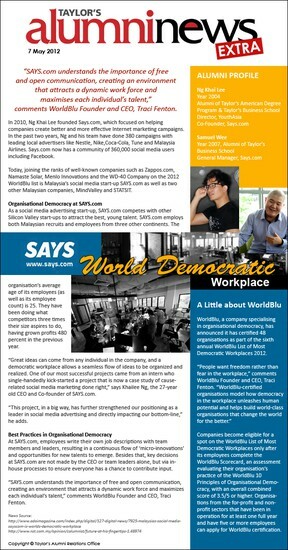 SAYS puts Malaysia on the map and joins the ranks of other notable companies such as Zappos.com, Namaste Solar and Menlo Innovations in the WorldBlu List of Most Democratic Workplaces™ 2012, joining 39 other companies around the globe. The organizations range in size from five to 90,000 employees, representing over $17 billion in combined annual revenue. This is the most global WorldBlu List to date, indicating a global movement towards democracy in the workplace. 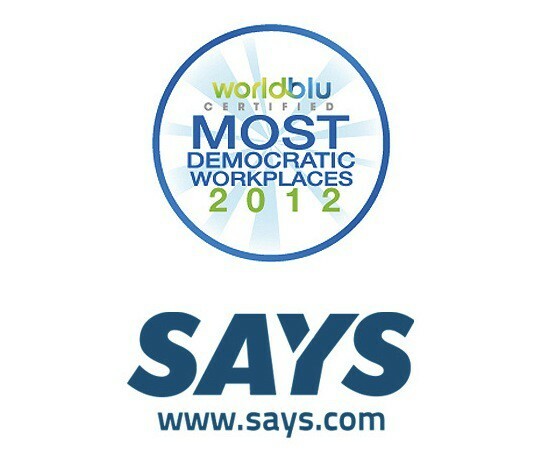 Companies become eligible for a spot on the WorldBlu List of Most Democratic Workplaces™ only after its employees complete the WorldBlu Scorecard™, an assessment evaluating their organization’s practice of the WorldBlu 10 Principles of Organizational Democracy™, with an overall combined score of 3.5/5 or higher. The WorldBlu Scorecard™ was developed based on a decade of research into what makes a world-class democratic company. Organizations from the for-profit and non-profit sectors that have been in operation for at least one full year and have five or more employees can apply for WorldBlu certification. WorldBlu-certified organizations make use of a variety of unique practices that are distinctly democratic, give power to their people, and contribute to profitability, high performance and employee engagement. 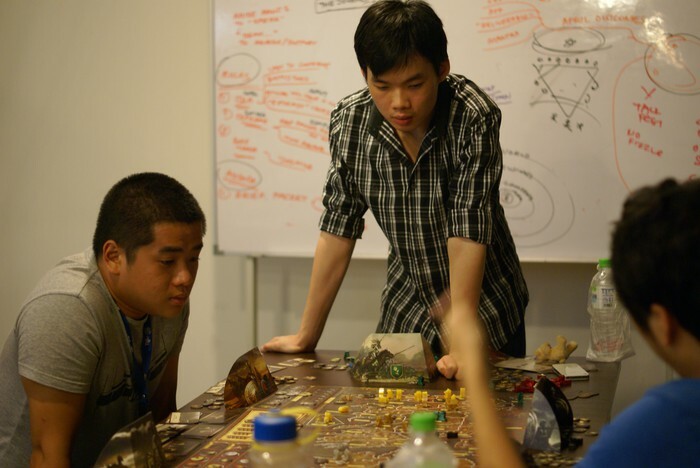 Khailee Ng, CEO and co-founder of SAYS shares openly about the work culture at SAYS, how it's practiced, and why it's the backbone of the company. 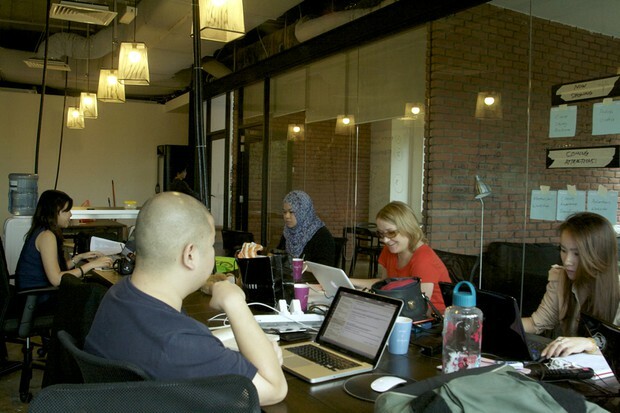 Interview with Khailee Ng of SAYS (1/5): Why democracy at the workplace? Q: A democratic workplace attracts top Gen Y talent and grows the bottom-line. Does it mean that there is no place for Gen X in that team? Khailee (CEO, Co-Founder of SAYS): Oh man, the Gen-Y label again. Eew. I got to get my press people to stop using that word LOL. You'll find people of every age wanting freedom and choice at work. People at any age may be more 'new' vs 'old'. Young people can sometimes be very conventional as well. Boils down to what people value. And broadly speaking, people who are in this generation of workforce value freedom and choice at work, because that's what we value in life. Most individuals who are smart and motivated flourish with freedom and choice at work. Young and old. However, it's been observed that young and smart teams function REALLY well with freedom and choice. The world's fastest growing companies, like Groupon and Facebook know this, which is why they achieve things some other older companies cannot. Q: A democratically managed workplace is about giving power to the people. How does one achieve that while imposing control and getting things done the right way? 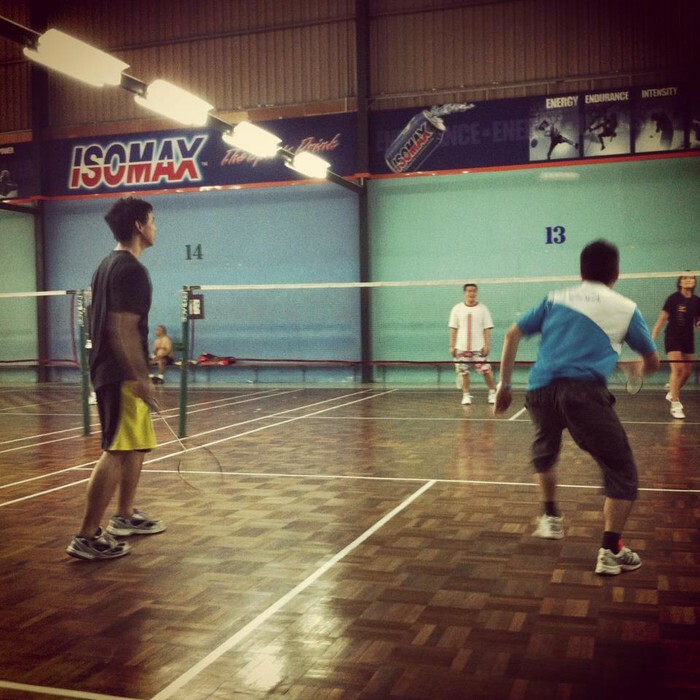 If the 'big boss' always wants to have control and have things done his/her way, then forget it. If the 'big boss' trusts the people he/she hires, makes the mission and key results really clear, provides the right tools, incentives, support, and systems, you have a chance. The employees must also want to be empowered. They must want to prove they can deliver brilliant results. The whole process is a journey, a really rewarding one for your soul, and your bottomline. Interview with Khailee Ng of SAYS (2/5): Has this democracy been abused? Please tell us how organizational democracy has benefited your workplace’s bottom-line. 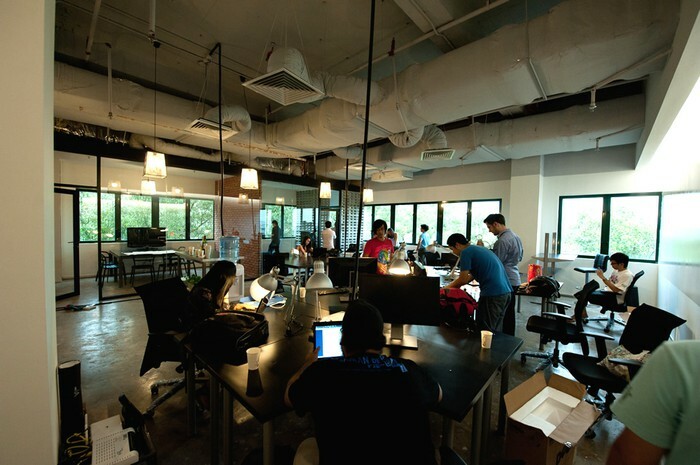 Interview with Khailee Ng of SAYS (3/5): How does this democracy benefit the workplace? We have 2 stories about the impact one person can have, when given the freedom in the workplace to do the impossible. In October 2011, SAYS.com had a side project for its 20 year old intern, Kimberley. The idea? To extend our social media advertising expertise and media power to drive public awareness to 30 selected non-profits and grassroots causes. The subsequent explosion in social media conversations around this project prompted nationwide press coverage across TV, radio and newspapers, turning the whole project into a case study of cause-related social media marketing done right, and unintentionally attracting $200,000 of new client projects for SAYS.com. This would not have happened if not for the idealistic and capable 20 year old intern, Kimberley, who was given $30,000 of project funds and the freedom to drive the project from start to finish. 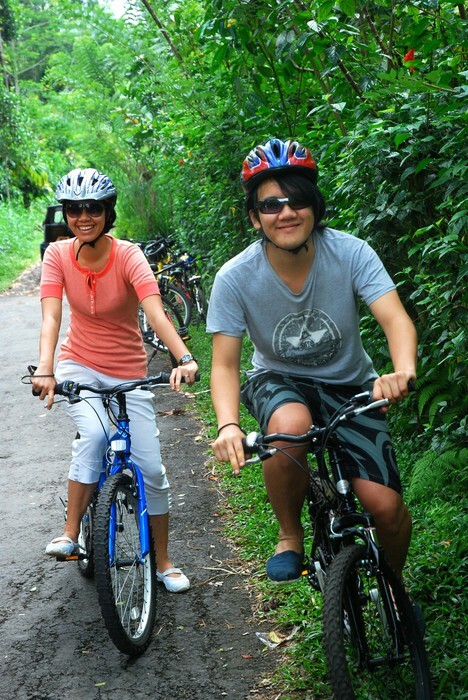 An adventurer at heart, Charlotte left her comfortable life in Denmark to explore living and working in Malaysia. 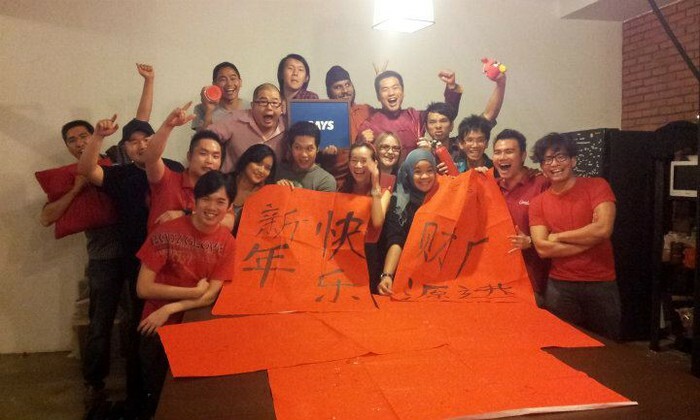 She joined a communications company, which left her with such a poor impression of the “Malaysian work culture” that she was about to board a flight back to Europe. She was introduced to SAYS.com, where she found the work culture even more empowering than the companies she had worked for in Europe, that she stayed on in a sales role. She is now directly contributing to 70% of SAYS.com’s revenues! Imagine the financial impact had we not been able to attract or retain her! Q: What is your organization doing to promote or be a role model for organizational democracy with your clients and community? HR leaders in the country have gathered in the office of SAYS.com (cheekily referred to as 'the Secret Hideout'). 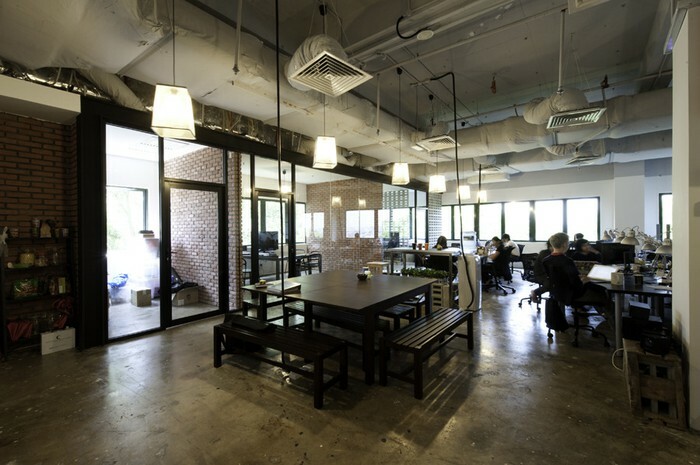 We’ve had the Head of HR from Astro and Maxis, two major media and telecommunications companies in Malaysia, and managing directors of our clients come over to gain insight to the SAYS.com work culture and the workspace. Leaders in SAYS.com have also been on numerous TV and radio appearances discussing “Gen-Y in the workplace” and related issues. “You have to be at the Says office to know that they really mean what they say. The energy and enthusiasm is super high and has less of an office feel and more of a gathering of like minded friends. Hope they can keep this environment as they grow bigger." "Blown away by their knowledge and mission, I left their office feeling super impressed and inspired." 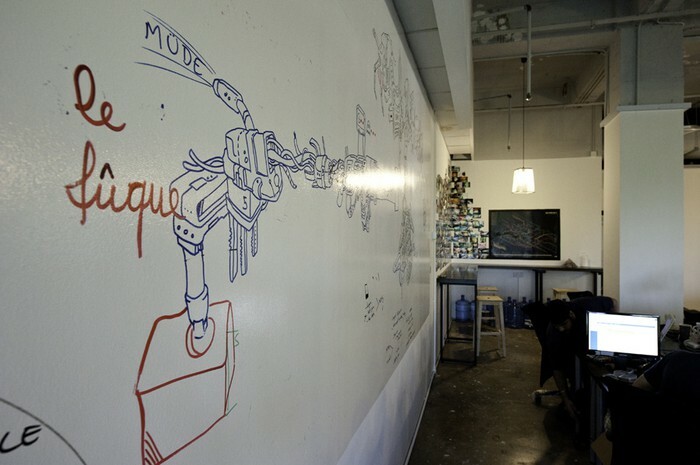 "The SAYS.com office promotes the liberation of ideas and the imagination. 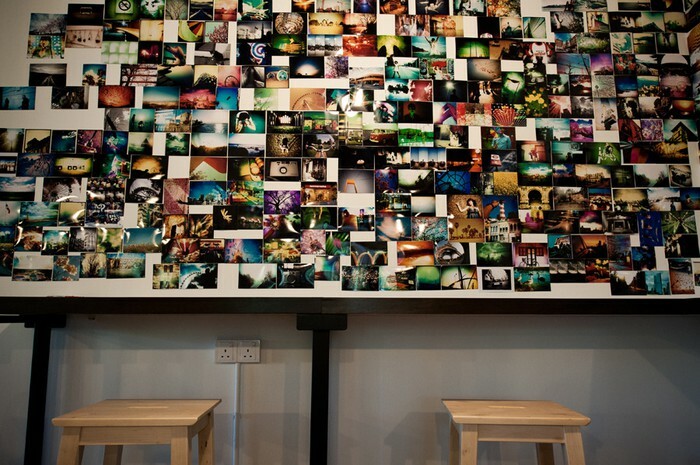 There's a great sense of community & sharing - truly a workspace built by Gen Y's for Gen Y's." Q: What are some of your best democratic practices at SAYS? Give us examples of how you practice organizational democracy. Tell us about the In Your Face Lunch. How does it facilitate dialogue and listening? The In Your Face Lunch is... not as intimidating as it sounds. 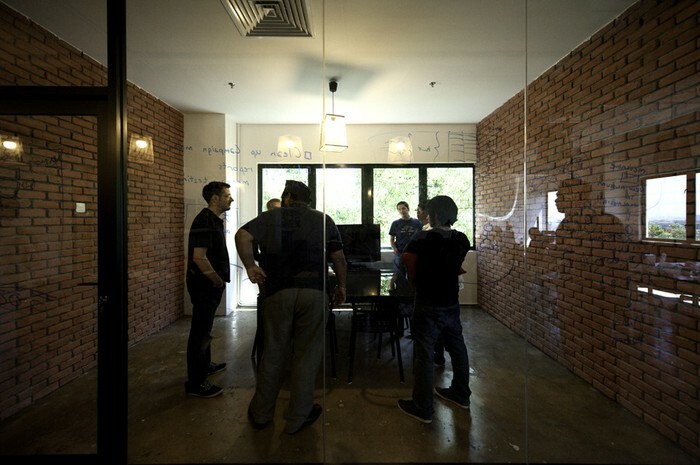 Every month, each team engages in an open and candid dialogue about team progress, issues, ideas and individual feedback, with a strict format to ensure relevant matters rise to the top. The shape of the lunch table must be round, so everyone in the team gets an unobstructed view of everyone else (hence, in your face). The table should be in a private area / room, so there is a sense that it is a safe place for conversation. 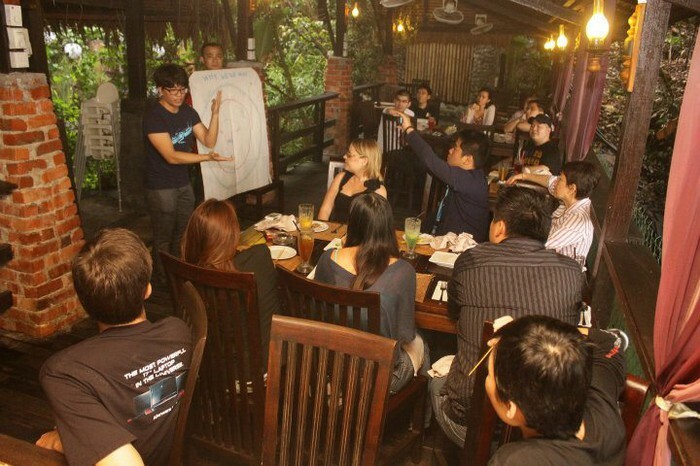 What the team should Keep, Start, and Stop is discussed and summarized for next action. Everyone takes turns to ask for advice / feedback about personal challenges / growth opportunities. 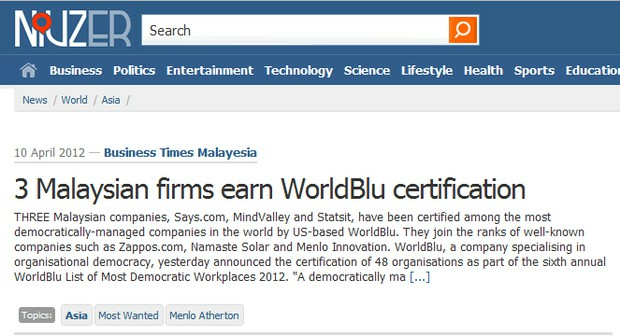 "WorldBlu, a company specializing in organizational democracy, has announced it has certified 48 organizations as part of the sixth annual WorldBlu List of Most Democratic Workplaces 2012, published annually on“Democracy in the Workplace Day." 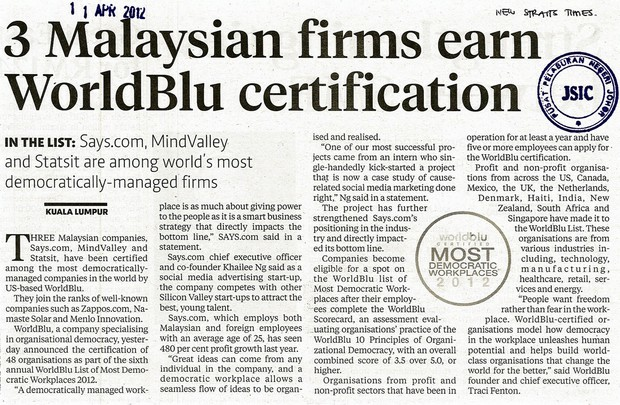 THREE Malaysian companies, Says.com, MindValley and Statsit, have been certified among the most democratically-managed companies in the world by US-based WorldBlu.